"THE LIFE, MISSION, AND LEGACY OF ST. FAUSTINA” MONDAY, APRIL 15, 7-8 PM Our Lady of Pompeii Church. Join us for an evening of interesting personal stories about the Life, Mission, and legacy of St. Faustina presented by the inspirational Rev. Jacek Mazur. 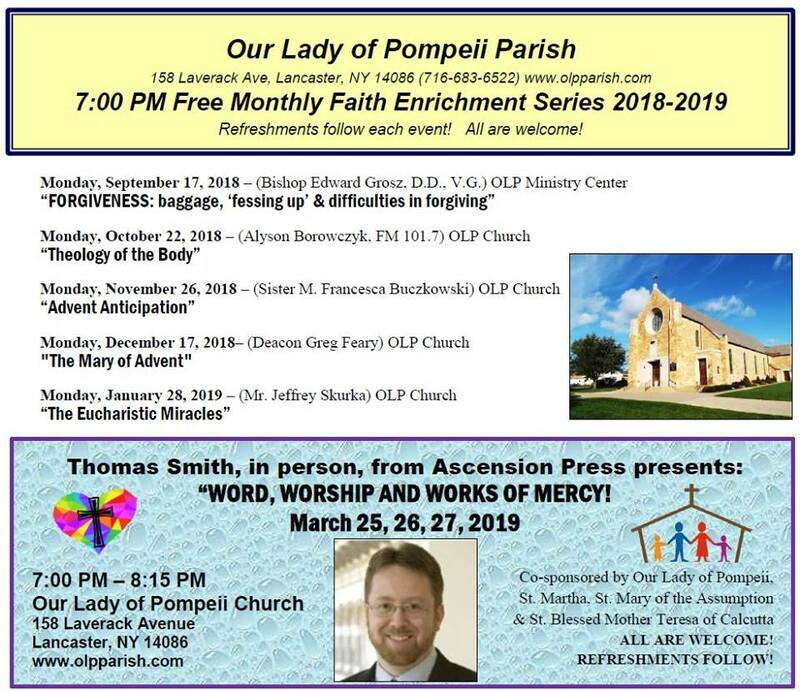 Photos from our November 2018 speaker series with Sister Francesca Buczkowski on "Advent Anticipation"
Photos from our October 2018 speaker series with Alyson Borowczyk on "Theology of the Body"
​Photos from our September 2018 speaker series with Bishop Grosz on "Forgiveness"
Photos from our November 2017 speaker series with Deacon Greg Feary on "Jesus Prayer - Prayer of the Heart"
Photos from our September 2017 speaker series with Bishop Edward Grosz on "The Basic Messages of the Marian Apparitions in Relation to the Gospel of Jesus"
Photos from our October 2017 speaker Series with Dr. Gloria Roetzer on "DNR to Physician Assisted Suicide. How did we get here?" Photos from our January 2017 speaker series - Deacon Mark Kehl with "The Real St. Joseph and the Tools for Real Manhood in the Home, the Church and the World" and Theresa Kehl with "Women Praying Through the Knots, A Spirituality of Imperfection"
Photos from our April 2016 speaker series - Deacon Ted Lina - "The Physical Suffering of Christ"
​Photos from our February 2016 speaker series - Deacon Greg Feary -"Praying with Religious Art"